Leray is a little girl born late April 2015. She is in a slightly different situation than many of the other children because both of her parents are in the village. 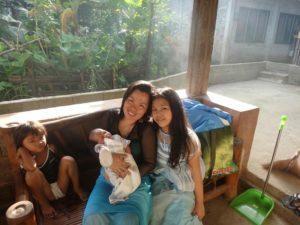 Inday, the lady who takes care of the children’s home, with three of the children. I think it is Leray. There were 2 babies born within 3 days. Her father is a general laborer that takes whatever work he is able to get. He typically gets as much as 14 days of work a month. He usually is paid $2-3 USD a day. Leray was born with a skin condition that caused her skin to crack and bleed, causing her constant pain. The medicine cost $26 USD a month. This is about half of what the family was trying to live on for their daily needs. After several times of trying various other treatments that didn’t work, her parents were very distressed. We offered to cover the cost of the medicine so she could remain with her family.